"The Prophets must walk with you, Doctor." "Well, the Prophets and I were lucky." Well, this was a doozy of an episode. I was not expecting to deal with moral quandaries today. I have to admit, I was fully on Bashir's side through basically all of the episode. 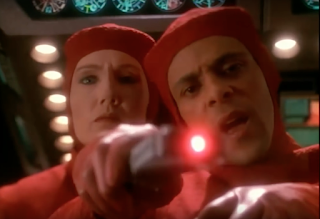 Maybe it's just my inherent distaste of Kai Winn talking, but it seemed clear that Bashir had the moral high ground. Yes, the treaty was obviously important, but Bareil's life was at stake. He was clearly in pain, and Kai Winn kept pushing him further and further when he really just needed to recover. But then, that position completely invalidates what Bareil thought and wanted. Bareil wanted to help with the negotiations in anyway that he could, even calling Kai Winn in in order to speak to her about it. The moral quandary was less about the sacrifice of one life to benefit many (a very, very common Star Trek theme), but rather who has the final say regarding medical intervention, and when should that intervention stop when the patient is unable to make his own decisions? You could certainly make the argument, as Bashir tried to do, that Bareil was too emotionally compromised in order to make accurate and intelligent decisions about his health. That's why he wanted Kai Winn to release Bareil from his responsibilities. That was probably my favorite scene of the episode, even if I couldn't help but think that purposefully antagonizing her will come back to bite Bashir someday. Still, lying and manipulating someone is very rarely the correct answer, and that's what Bashir wanted to do. Doing that would work to strip what agency that Bareil had during the very end of his life. Even Kira, who obviously loves and cares for him, knew that he wouldn't want to spend who knows how long in a stasis tube. Which brings us to another rather common Star Trek theme: the beauty and uniqueness of intelligent, mostly organic (and Data) life. Yes, they could theoretically replace the entirety of Bareil's mind with a computer, but he would lose the "spark of life" within him, rendering him unrecognizable to the people who knew him best. I know that I personally wouldn't want to live like that. Even replacing only half of his brain robbed him of his perception and sense of touch. I'm not necessarily as invested in this show as I am for some of the others that I review here, but I still teared up as Kira told a dying Bareil how they met and how she fell in love with him. It was a powerful and moving scene that served as a wonderful end to the character. I just wish that they had pushed the fact that Kai Winn was perfectly happy to let Bareil die once the peace treaty was signed. Kira had a throwaway line about it, but that was about it. Kai Winn really got basically everything that she wanted with no drawbacks, and it felt just a bit too pat considering the fact that the heart of this episode was a moral debate with no real right answer. We also had the subplot involving Jake and Nog. I understood what the episode was trying to say. If you're friends with someone and truly value your bond, then you work together to look past the things that are, according to your own personal background, unsavory or disgusting. If you are able to do this, then true friendship is possible regardless of how different you are from each other. It's a very nice sentiment, but it personally made me very uncomfortable in this specific context. To me, Nog's behavior and attitudes towards women were unacceptable, regardless of what his culture is. To have it swept aside so quickly and easily left a very bad taste in my mouth. I'm glad that Kai Winn acknowledged that she was an awful diplomat. That brief scene between her and Cardassian delegate was painful to watch. I can't tell which was the more... interesting outfit. Bashir's surgical scrubs, or that shirt Jake was wearing when he was "arrested." Bashir: Eminence, you're the Kai. These are your negotiations. Let this be your moment in history. Finish the talks on your own, and you won't have to share the credit with anyone. Kai Winn: You say that as though success is guaranteed. Bashir: Of course. If the talks fail, you'll need someone to accept the blame. A scapegoat. You're a coward. You're afraid to stand alone. Kai Winn: Bareil's already made this decision, Doctor. I won't interfere. And Doctor, I won't forget what you've said here. Bareil: So, are we going to be playing springball next month? Kira: You bet. Although I may have an unfair advantage. Bareil: You mean playing against a dead man? Kira: I'll... I'll never forget the first time I saw you, the day you came to the station. You had such a serenity about you. I thought you had all the answers. It really got on my nerves for a while. Then I got to know you, and I realized you were just as confused as the rest of us. You just accepted your confusion, better than anyone I've ever known. That's when I realized I loved you. Besides the stuff with Nog, I really liked this one. Three miraculous recoveries out of four.